So, what have I been waxing today? No, not my legs. In celebration of November, I re-proofed my old wax Barbour coat. A few weeks ago, I found a long-forgotten Barbour in the back closet. In the spirit of my mantra, "wear the old coat, buy the new book", I decided it was cool. 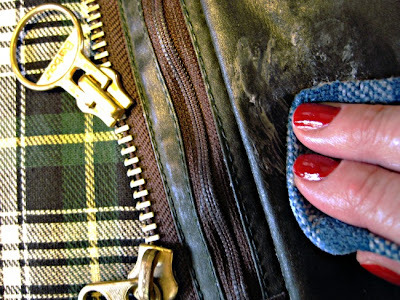 I had forgotten all the fun nooks and crannies, hidden zipper pockets, and such, Barbour incorporates into their coats. Much of the wax had worn away, so I ordered a can of wax thornproof dressing, to spruce it up a bit. The whole process was fairly easy, but time consuming. If you're going to attempt this project yourself, allow at a minimum of two hours, from start to finish. Now, amazingly enough, it looks brand new, even though it was purchased in 1989. 1. 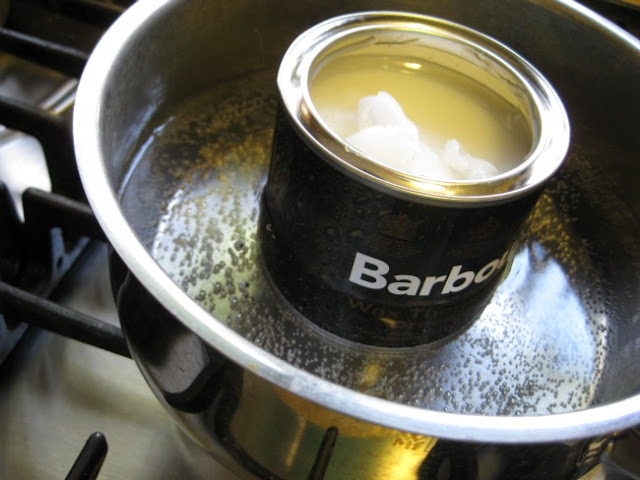 Open the tin and place in a pan of hot water, until the wax is soft and liquid. 2. Work the dressing well into the surface of the coat, a small area at a time, using a soft cloth or sponge. Make sure you pay extra attention to seams, creases and dry patches. Rub it in well, don't just paint it on. 3. For a factory finish, blow evenly with a hairdryer until all the shiny places look cloth-like. 4. Hang the coat overnight, in a warm place. That's it. Easy peasy. I took this shot for comparison. The left side is before and the right side, after. What a difference. 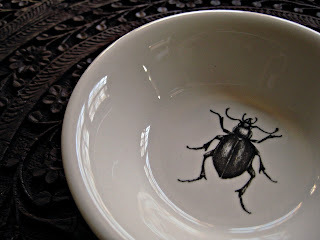 Remember a few weeks back when I posted on the wonderful Laura Zindel pottery, with the spiders, bugs and fiddlehead ferns? Suki spotted some in a local shop in Vermont and was so sweet to send me a piece of my very own for my birthday. Thank you, dear friend. The lovely little bug dish is right at home at the manor. This is a great post of practical value to me. My old Barbour wax jacket was purchased about the same time as yours, and it looks so filthy that I seldom wear it. I think I will follow your lead on this and see how it comes out. A new wax jacket and a piece of that pecan pie you featured recently? What better way to enter the winter. My husband has been pleading for a Barbour coat and I keep putting him off. 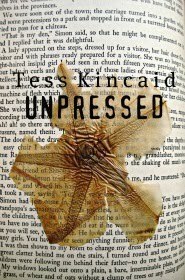 But I read this and am completely rethinking the idea - it will wear forever, but best of all, gives him a project! Lovely post and lovely coat! You worked miracles on that Barbour coat! Carrying my camera bag around, ruins all my coats (or summer dresses, blouses, etc.). I wonder whether a Barbour coat would last a little longer. LOL.. for a minute I thought, why is Willow talking about waxing her legs? The bug dish is lovely, what a sweet friend. Well, I hope you have more luck than Lady Magnon. After re-waxing her elderly Barbour it leaked just as before. Mine is beyond saving, but I wear it anyway. This is all new information to this California born and bred me. I think the photo speaks of the wonders of the wax treatment...enjoy your new books! Lovely gift! The village we lived in was real Barbour (and Hunter boots) country - although I never knew anyone who EVER cleaned or waxed theirs. If I had known you could have I wouldn't have thrown mine out in our last move! "wear the old coat, buy the new book" - this is why I have such a girl crush on you willow. Wonderful words. Your coat looks great! That is recycling at it's best. I'd never heard of a Barbour wax coat before. How interesting--I'm intrigued. The results of your labor are impressive, too. Wow--I'm going to have to do some research now. Thank you for sharing the process and your coat! Oh, and I love the bug dish, too. How funny it would be to finish up a delicious dessert only to find that bug staring up! The thought makes me laugh. I'm wondering now whether to have a go at my ancient Barbour, although I fear that it is probably, like Cro's, beyond all hope. The cuffs are unraveling and I was thinking of sending it back to the firm for a complete overhaul. A tin of wax would be cheaper! Meanwhile I've moved on to a Zeeland hunting jacket, warm, quiet, dip at the bum for sitting and lots of pockets. Take a look at the Janet Haigh her work blog for a memory lane on her father's old Barbour. 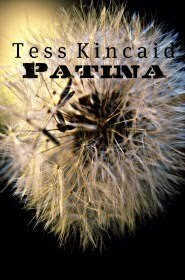 We follow a similar philosophy for our children ~ "wear the hand-me-down clothes (and coats), we all get to buy new books"! hope that you have fun! Your jacket is so grateful! Nourished yet for another decade! Love the bug! 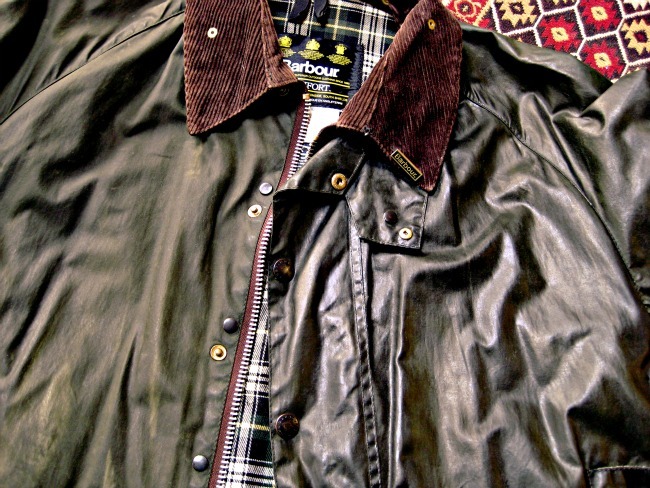 A Barbour that looks new? Not done here, I'm afraid. Mine has holes round the sleeves, has never been re-waxed and still sees daily service for doggy rambles. When I bought the coat I also bought the tin of wax, but I've never dared use it. That's my excuse, anyway. It is also not called anything but 'Barbour'. Not jacket and never, never, coat. I've had to learn all that the hard way. I've been following the great Barbour jacket saga. The closest I've been is to own an Australian waxed riding coat. I loved my old coat, but gave it away when I gave my horse to a friend. I may have to find a jacket similar to yours. I love hidden pockets & zippered ones. They make live easier than carrying a bag. Did you clean you coat first before waxing? Lizzy, no, they say not to wash or dry clean your Barbour, since it removes all the wax. I just applied the dressing right over the old wax. It's amazing how well it blended in. WT has one of those Australian waxed riding coats. He looks very dramatic in it! even your nose twitches with joy. life, to enrich your days to come. more, recalling the heartfelt gift. Well done! Your Barbour looks amazing. I would have lost patience and focus well before two hours were up. Love the jacket, bug dish to boot! Buy the book, rewax the jacket, I'm all for it, Willow!! Dear Willow, I do so agree that there is nothing to compare with a waxed Barbour coat. They are brilliant!! And, yours looks positively brand new after its waxing treatment. The only thing I find is that they rather smell of fish....is this the case after it is newly waxed? The coat looks great! But was it time consuming? Great job. It's that coat, again! Gorgeous and reliable though it might be -- I have the name of someone . . . ? I have truly learned something new today. Waxing a coat....imagine that! I find it all oddly thrilling and now wish I too had a Barbour coat I could wax. I guess a Barbour coat is good for going out in the rain. Wait! I live in Arizona. What. Is. Rain????? 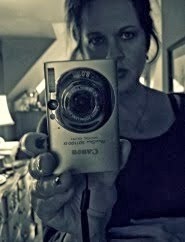 wow, Willow - I'm struck by the fact that besides being a very decent poet, you're also a talented photographer. Yesterday's image of eggs and leaves was sublime, but today's shows that you can turn even a can of wax in a pot on the stove into a stunning image. I thought you were going to say you were waxing furniture. You did a grand job on the Barbour. Great post! I love the dish. I wonder if that is a deathwatch beetle? What a lovely gift. It looks great! What a good way to spend a fall day, getting ready for cold, wet, dreary days--you'll feel dry and toasty once they come now, and you'll look great. Love the dish--that was very sweet of Suki! 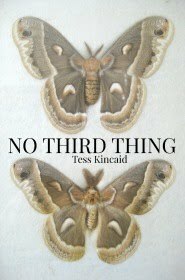 Kristen, heh-heh, just as long as it's not a fertility beetle. Whew! That sounds like a lot of work...but worth it considering the beautiful shine on your Barbour. That coat is such a classic. Glad you spruced it up. Also love that beetle bowl. Catching up here after a busy weekend. OK. VERY COOL that you're waxing your coat. The pic of the eggs and nest made me so melancholy! Beautiful. You with yellow eyes? GAVE ME THE WILLIES!! To the Manor Born....Barbour coat...wax and all! Dang! I know I used to have one of those. Now where did I put it? While you're at it, you could tackle my leaky Dry-za-bone as well. I warn you it is full length and has a slit at the back with a strap that goes under the hors's tail when riding. . . pretty plz??? Mama Mia again.....breathtakingly camera lens!! Love this post! Love the beetle! Hate Barbours - they smell! Paris, a Barbour sheet? Well, do tell! Gosh I don't know where my Barbour is! Well done on the waxing. If I didn't know better, I'd swear you were English! Do you have a pair pf green wellies as well?? And now it's time to do the legs! LOL Great post! That is a very handsome beetle! What is this coat made of? I know nothing of Barbour coats. I suppose I should go and look this up. I have a leather coat in need of attention. Gary, this Barbour is a cloth coat with a wax finish.